Karma Hill PHotography. Powered by Blogger. 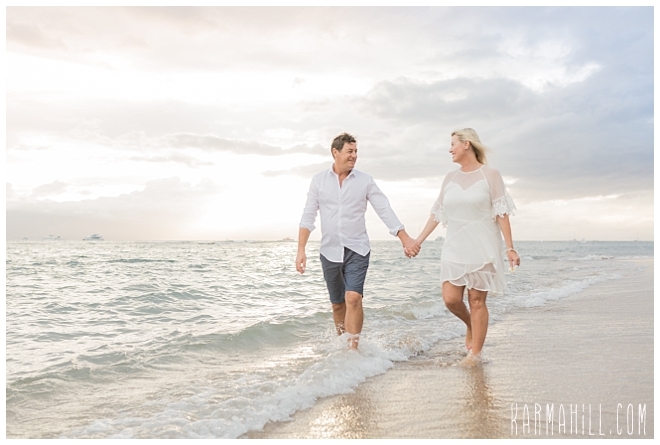 On a softly lit morning, Kasa and Matt joined their loved ones on the beautiful shore for their dreamy Oahu Beach Wedding. It was the moment they had been waiting for, a time to celebrate. 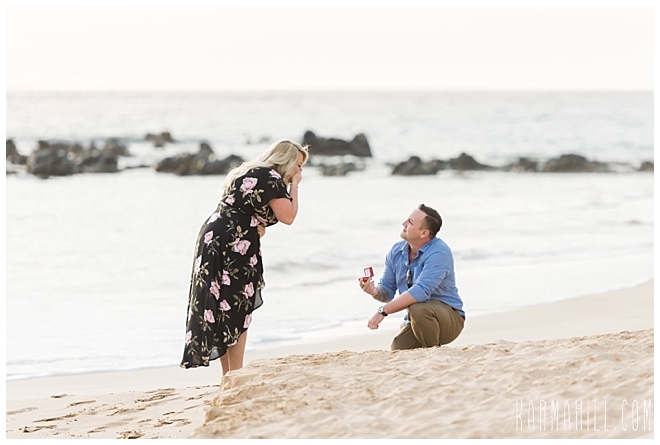 With the sun waking on the horizon, and the tropical air tickling their faces, they declared their love for one another and exchanged the vows that will guide them through the years to come. With their Maryland home a distant memory, they focused on the romance dancing on the breeze to the sweet sound of the swaying sea. It was a gorgeous day and one we were so glad to capture for them. Thank you, Kasa and Matt, for letting our team be a part of you incredible moment. We wish you a lifetime of happiness as you enjoy the years to come. Congratulations & Warm Aloha!!! Despite running in the same social circles for the last forty years, it was never the right time for Daniella and Matthew. Until that is, a friend intervened. Convinced they would be perfect together, a lunch was facilitated and a romance blossomed. From that day forward, the adorable Australians were inseparable. 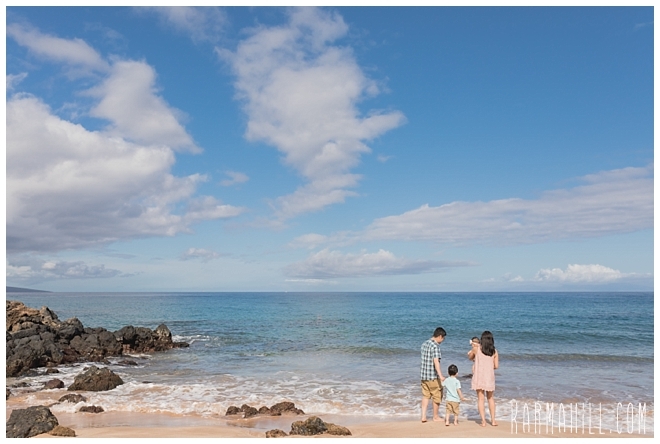 Excited for their nuptials in August, they decided to celebrate with a Maui Engagement Portrait while on the island. A pastel lit evening lent itself to the scene, creating a lovely setting for the gorgeous love birds. Danielle and Matthew, thank you so much for allowing our team to share in the joy of this fabulous time in your lives. We are so happy for you two and wish you all the best for your big day this summer. Congratulations & Warm Aloha!!! When you fall in love in paradise, a part of it always stays with you. 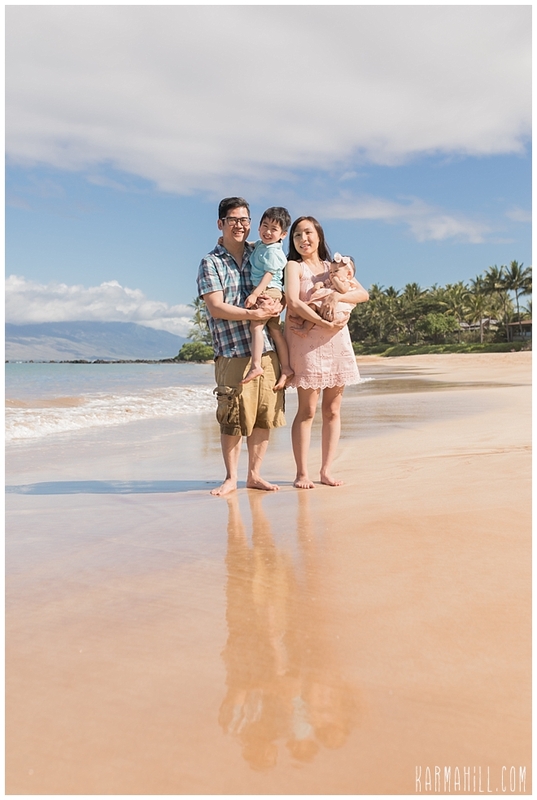 For the adorable mom and dad of the Rozenboom crew, Maui was where their love story began. Having met and fallen for one another when living here years ago, they wanted to build some amazing memories with their stunning daughters here. 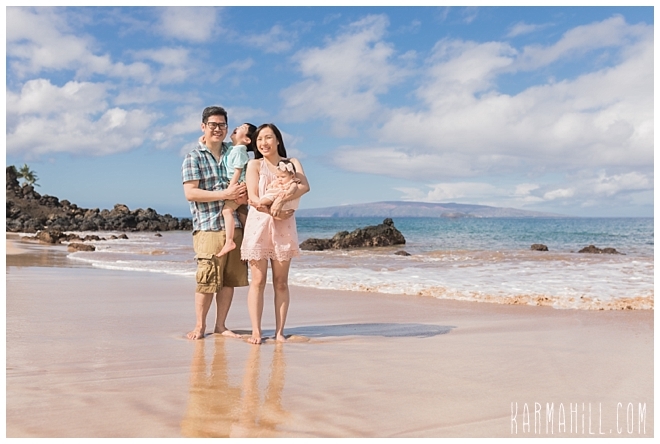 On the very beach where they celebrated their Wedding Rehearsal BBQ, the fabulous family of four met with their Maui Family Portrait Photographer beside the aquamarine scene. 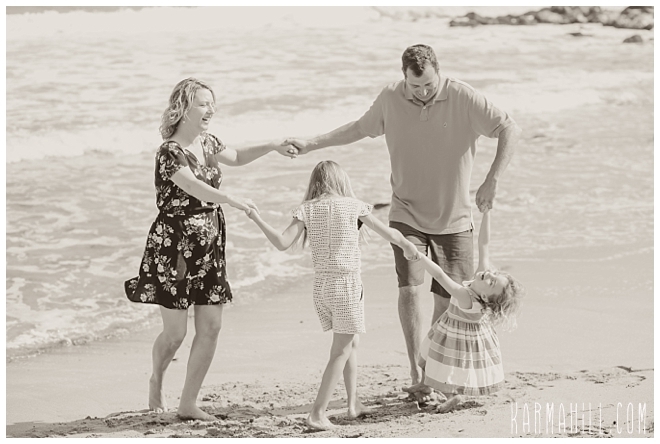 Seeking fun and candid photos, the California residents recognize that sometimes the best memories come from simple moments. Now celebrating nothing more than fun filled family togetherness, the giddy sounds of the girls' laughter is plenty of reason to rejoice. Thank you, Rozenboom Family, for letting the Karma Hill Photography team capture some of the magic of this moment. Your family is stunning and we can't wait to welcome you all back again one day. Warm Aloha!!! I LOVE getting to see how our clients' lives change over the years. 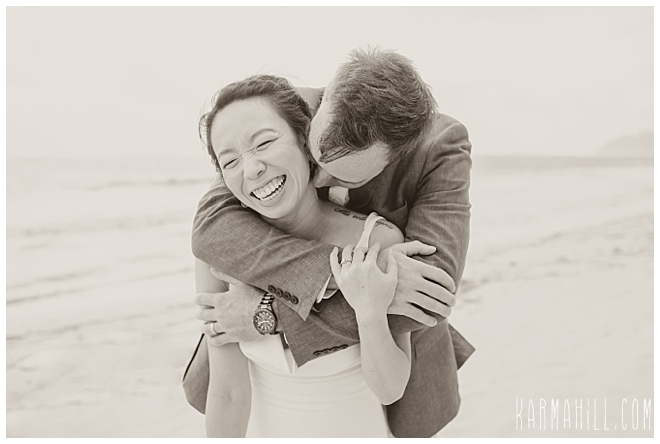 When I first met Katie and Raymond, it was for a romantic couple's portrait. A couple years later, we welcomed an addition to the session in the form of a bouncing baby boy called Evan. 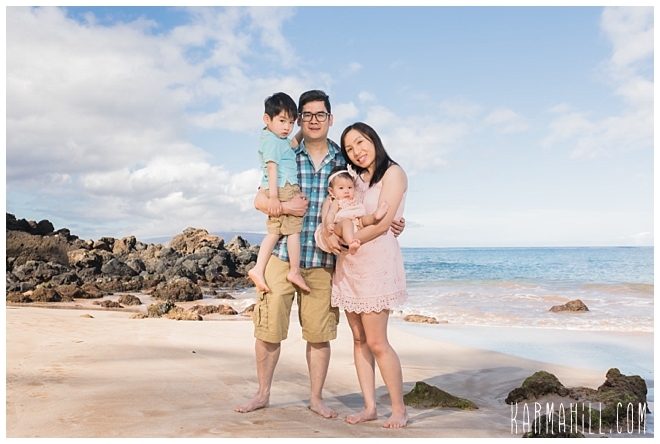 Now, their Maui Family Portrait has reached four as Maddison joins the ranks. What a difference a few years makes! 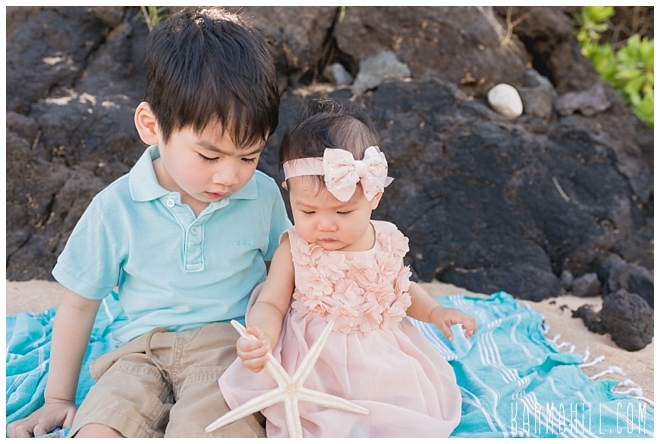 As three year old Evan struts his stuff as a big brother, he does an outstanding job of looking out for his baby sister. 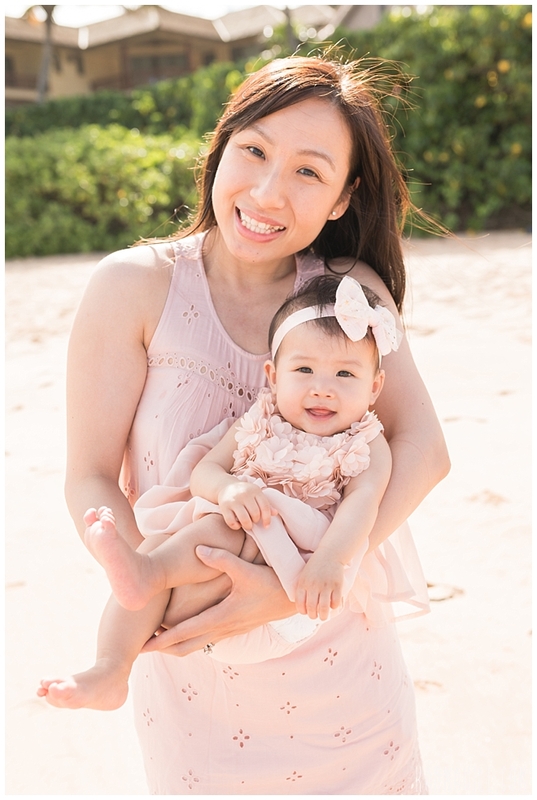 Though she prefers being held at all times, precious Maddison was in awe over her surroundings on a beautiful South Maui morning. 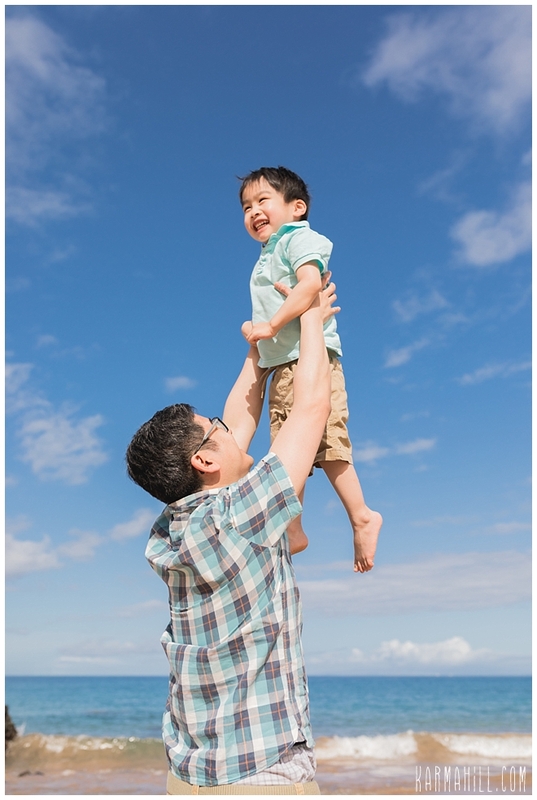 Rising with the sun each day, the Chan Family's kids were raring to go and eager to meet each day's new adventure. 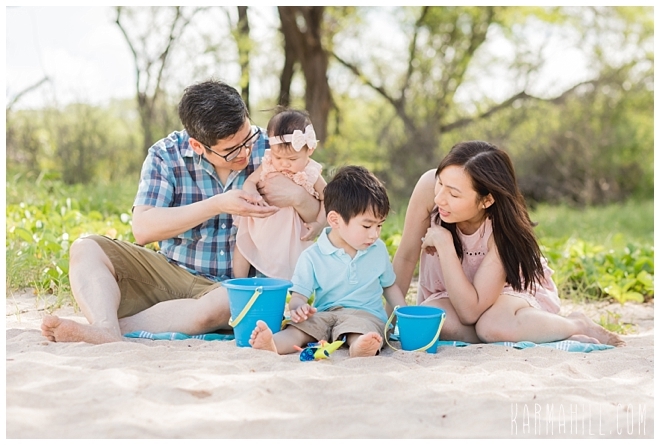 What better way to capture the fun and happiness of their first family vacation as a group of four. 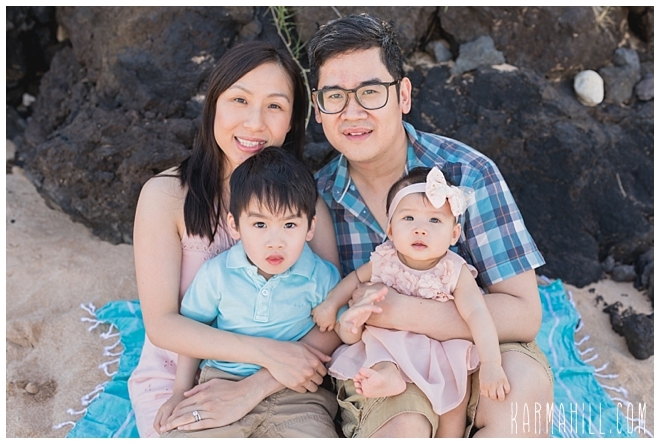 Thank you, Chan Family, for thinking of Karma Hill Photography again. What an honor it is to document the incredible changes your lives have undergone. 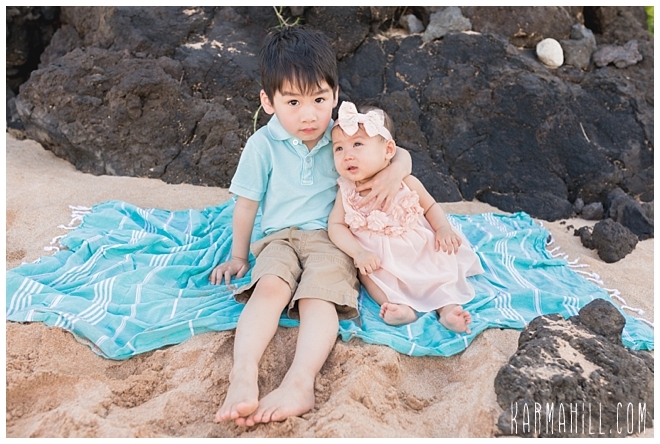 The kids are adorable and we can't wait to capture them throughout the years. Don't be strangers! Alberta isn't that far! ;o) Until next time, congratulations on your newest addition and Warm Aloha!!! 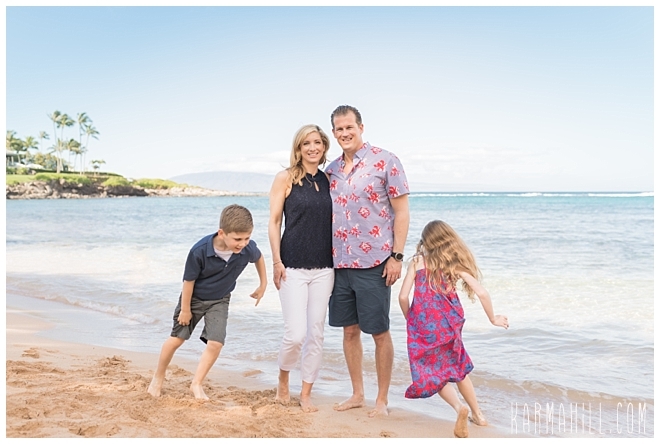 Check out our last Maui family portrait with the Raney & Hanson families! One of my favorite times of year is when we get to welcome back the Raney and Hanson Families. 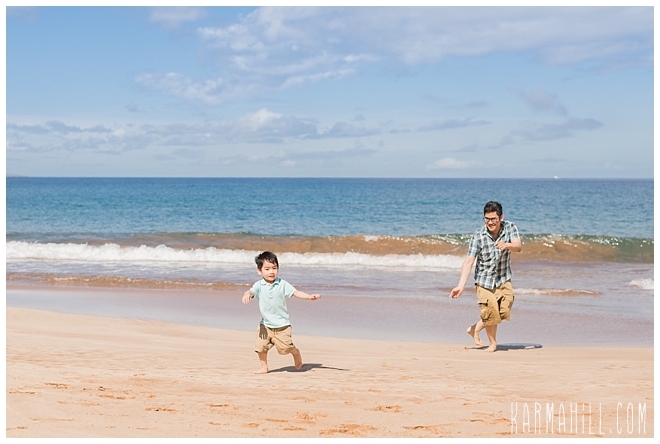 Though the Hanson parents remain elusive to capture during their Maui Family Portraits, both families are so much fun to work with. Making their annual voyage here, this was the sixth time I had the pleasure of photographing these two fabulous families. Treated to a stunning morning, this troop has a blast everywhere they go. 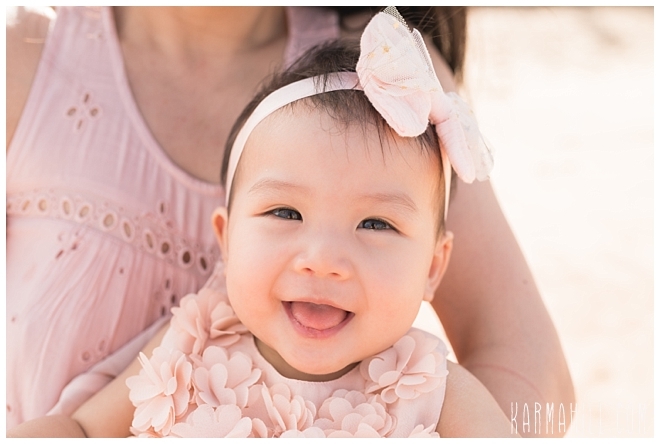 I am so grateful they choose Karma Hill Photography year after year. What an honor to watch these incredible kids grow up, and to capture the sweet memories made each year. Thank you, Raney and Hanson Families. I always look forward to our time together and truly appreciate your continued support. Looking forward to next year already! Until then, Warm Aloha!!! Gathering each year for some fun filled family bonding time, the Teter Family loves the cherished memories they make on these trips. 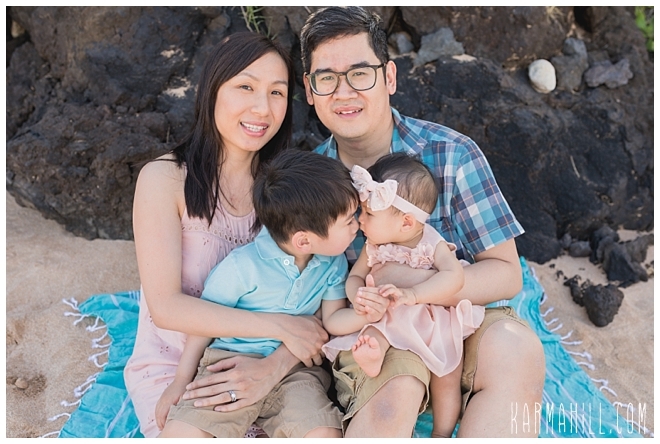 Wanting to capture some of that magic and have it last forever, they chose to do a Maui Family Portrait so the photos can stand the test of time. We were honored they fit us in the schedule, given the exciting adventures hey had planned. Between multiple snorkel excursions, and a trip to Pearl Harbor, there was certainly no shortage of fun to be had. 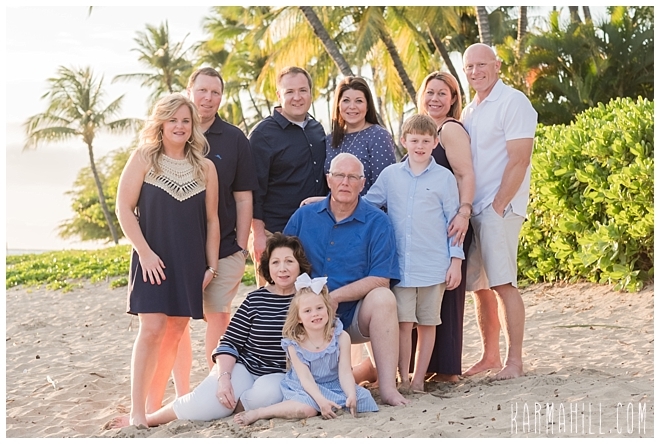 After more than 40 years of marriage, the proud grandparents from this crew are happy as ever that their family can carve out these special moments together. Thank you, Teter Family, for letting the Karma Hill Photography team be the ones to capture some of the fun to be had. It was a pleasure meeting you all! Keep on having a blast together! Warm Aloha!! !